Since 1987, chef Amonwadee “Dee” Buizer has been cooking up unique Thai dishes at restaurants around the country. In 2016, she opened upscale Thai restaurant Senae Thai Bistro in Tucson, where she strives to create fresh, creative cuisine that stays true to her Thai roots. Senae Thai was recently awarded the official Thai Select Distinction by the Thai Ministry of Commerce, an honor that is meant to recognize and promote authentic Thai cuisine worldwide. Shortly after receiving this honor, Buzier was one of only seven chefs from the United States selected to attend the recent THAIFEX 2018 International Trade Exhibition in Bangkok. Tell us a little about yourself and how you ended up in Arizona. I came to the U.S. from Bangkok at 11 years old, when I was starting sixth grade. I opened my first restaurant, Sweet Basil, in Berkeley, California, with my sister in 1987. Then I opened two other restaurants with my siblings in Los Gatos and San Francisco. Jim, my husband, swept me off my feet and took me to Washington, D.C., and there we raised our children. I had the opportunity to open a restaurant in Bethesda, Maryland, in 2000, and while we were operating that restaurant, my husband was recruited by Arizona State University. We decided that we would move westward, and I took some time off to raise our children while in Tempe. All the while, the University of Arizona was recruiting Jim to come and work with the climate scientists in Tucson. After our daughter graduated high school, we moved down to Tucson, and I discovered there are not many Thai restaurants, and a lot of them are a mixture of other Asian cuisines, so I opened Senae Thai in July of 2016. Was cooking a big part of your life growing up? How did you become a chef? My mom was a wonderful cook; she actually opened the very first Thai restaurant in San Francisco back in 1968 with her sister. When I was in high school I watched her in the restaurant and learned from her, but as a teenager I thought I would never open a restaurant. As an adult I found a passion for cooking because as I traveled, I was attracted to various types of food and wanted to learn how they were prepared. After coming back from trips, I would try to imitate the flavors. Back then we didn’t have Google, which would’ve made my life much easier, but that was a challenge that I put on myself to be able to re-create wonderful dishes while also refining my skills. How would you describe your cooking style and what inspires you in the kitchen? I try to source locally and work with the freshest ingredients I can possibly attain. I don’t drown my food in spices, but rather let the natural flavor of each of the ingredients shine on their own. I make sure all the flavors are there in one dish, well balanced, but you can distinctively taste each of the flavors in each dish. In Thai cuisine you have spicy, sour, sweet all nicely blended. I would say people inspire me to be creative in the kitchen. I enjoy cooking for people and getting to please their palates as best I can. In the presentation of my food, I use the food itself to present it in a beautiful manner. My philosophy is you need to please the eyes before you please the stomach. When you do that, then you enjoy the dish even more. 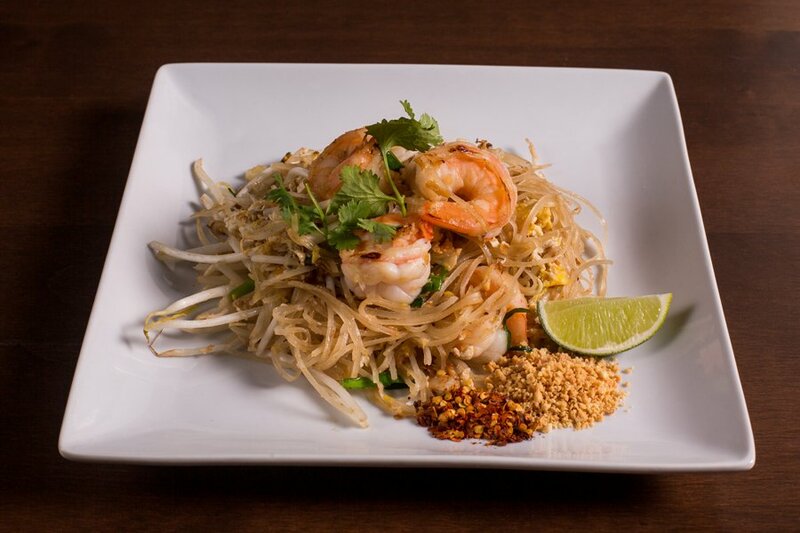 What do you feel sets Senae Thai Bistro apart from other Thai restaurants in Arizona? I believe the great attention to detail of freshness of the food and the refinement of my cooking, as well as presentation of the food and ambience of the dining room. My dining room is like my extended living room; I want people to feel warm and welcome. When people think of upscale restaurants, they usually think they have to dress up and pretend not to be themselves when they eat. But in my dining room, people do feel comfortable being there and enjoy their evening, while it’s still upscale. My kitchen is also semi-open and you can really see its beauty. Each wine on the menu is nicely paired with the food that we offer, and it’s a pretty extensive selection for a Thai restaurant. I believe I have the best pad Thai in town, but I have other beautiful dishes that people should come and try. Your restaurant was recently awarded the Thai Select Distinction. How did you feel when you received this honor? I had no idea such an award existed, and a person called me from the Thai Ministry of Commerce Thai Trade Center in Los Angeles and said they were coming to my restaurant and they wanted to present this award to me. The award was wonderful, and it truly affirms what I was doing here after all these years in the restaurant industry. You were also selected to attend the THAIFEX 2018 International Trade Exhibition in Bangkok. What was that experience like? When I was invited, I was excited and at disbelief, actually, to be one of 32 chefs worldwide and one of seven out of the States who were invited. It’s such a great honor. The purpose of the trip was to thank us for doing such a good job of cooking Thai food abroad and maintaining the authenticity, as well as being creative and innovative. In addition to that, they wanted us to explore the options of perhaps using other Thai products in each of our restaurants. The event itself was three full days of so much food, every day, all day long. There were thousands and thousands of ideas and products that I saw at THAIFEX. I met with the Top Chef of Thailand 2017 and Iron Chef of Thailand 2018; that was really exciting, and they actually cooked for us. It was great to share knowledge and ideas with chefs from around the world. I loved visiting different places in Bangkok to get some new ideas to improve or introduce in my Thai cooking here in America. What advice would you give to aspiring chefs and restaurant owners? You have to be passionate about what you do. That’s the driving force for me. It’s hard work. I love to cook, but it’s really hard work. Without passion, I don’t think one can exist in the restaurant industry so well. Senae Thai Bistro is located at 63 E Congress Street in Tucson. To learn more, visit www.senaethai.com.